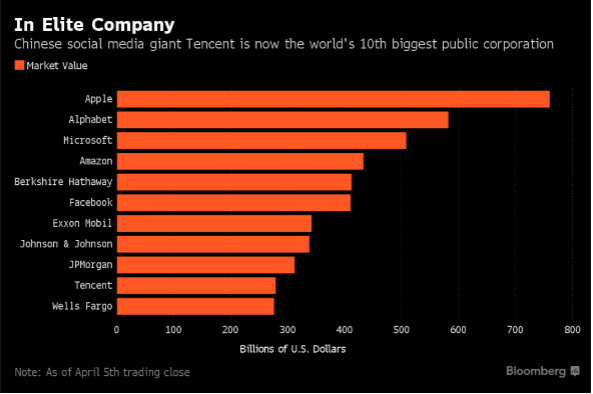 While largely unknown outside China, Tencent Holdings has quietly became the largest Asian company by market capitalization and in April broke into top 10 largest companies in the world. Most recently it was already valued at $395 billion. Best known for its messaging app Wechat (Weixin), the number 1 social network and messaging app in China, it is also the biggest gaming company in the world by revenue and one of the most prolific venture capital investors in the world. Through its Wechat ecosystem it is uniquely positioned to capitalize on the fastest growing industries such as mobile payments, online lending, mobile advertising and mobile gaming. Through my article I am going to present 5 reasons why I believe Tencent will be the world’s biggest company in the world by 2025. 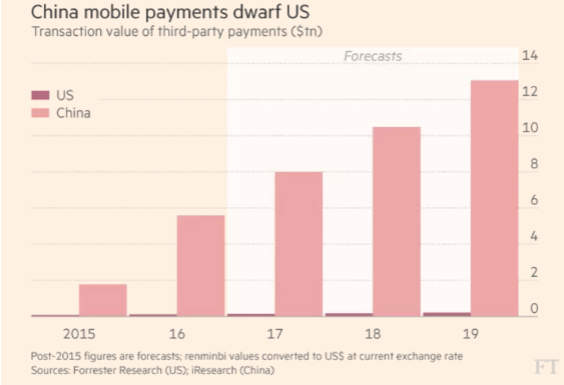 Mobile payments market in China reached $5,5 trillion in 2016, more than 50 times the size of the US market. While international media likes to focus on Apple pay and Android pay, they are miniscule compared to the Chinese giants such as Wechat Pay and Alipay. 425 million Chinese use their mobile phones as their wallets, a staggering 65% of all mobile users, while 5 years ago this market didn’t yet exist. 44,5% of mobile payment users said they no longer take cash with them when leaving their home. Tencent’s Wechat Pay has almost caught up with Alipay and had 40% market share in Q1 of 2017, up from 16% in Q4 of 2015 and according to one analyst in 2017 “the market share of WeChat payment is now on par with Alipay’s”. more than tripled YOY in Q4 2016. JP Morgan estimates online payment providers can grow their revenue by 42% annually to $29,3 billion in 2020. Armed with data about their 938 million Wechat and 860 million QQ users, Tencent knows not only which celebrities and brands they follow, with whom they chat and what they read (like Facebook), it also knows what they bought offline and online with Wechat Pay. Through their other investments in ride hailing company Didi, bike sharing company Mobike, food ordering unicorn Meituan – Dianping, and countless of others, it also probably knows where you go and what you eat. Tencent is not only trying to connect offline services to its Wechat Pay platform, it is also trying to create one of the world’s most accurate databases about consumers. Lack of privacy laws and users who don’t really care about privacy online (unlike in US and Europe) makes China an ideal ground for monetization of big data. Apart from mobile payments, China is the leader in online lending and investing. Wechat users invested more than 100 billion Yuan, around $15 billion into a money market fund through Wechat app. Tencent’s Webank, first private online bank in China, is offering loans of up to RMB200,000 to consumers without traditional credit checks and waiting, through, you guessed it, Wechat. Tencent can draw from the data they collect to create accurate consumers’ credit scores and offer them loans in a country where a lot of the population, especially in the rural parts, is still underbanked. Big Chinese state owned banks often overlook small consumers and rather lend money to big, state owned enterprises, which again, makes Tencent (and Alibaba) uniquely positioned to tap this market. JP Morgan estimates the online consumer loan market can grow to $95 billion in 2020, allowing the originators to generate $11,3 billion in total sales. In March, when JP Mogran wrote their analysis, Tencent was worth around $262 billion. If we add the median upside of 71,5%, JP Morgan believes the company will be worth $450 billion in 2020. As of August 9th, Tencent is already worth $395 billion. As in the west, user data can also be used for advertising. While Facebook perfected targeted advertisements in the last years, Tencent, armed with all the data Facebook has + arguably even more important payments data, has only just begun to tap into this opportunity. It only released its targeted self-service advertising offering (ala Facebook) in 2016 and its 938 million Wechat users and 860 QQ users are still underserved by ads. Wechat users typically see just one ad a day targeted to their demographic in their feed. 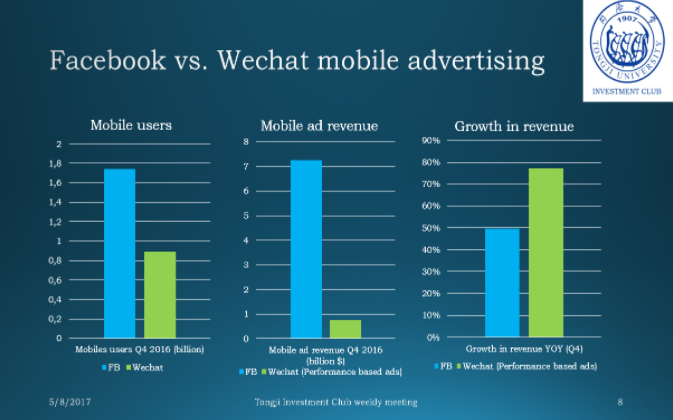 Facebook therefore monetizes each user almost 5 times better than Wechat, which is not surprising considering Tencent only began monetizing Wechat through ads in the last 2 years. 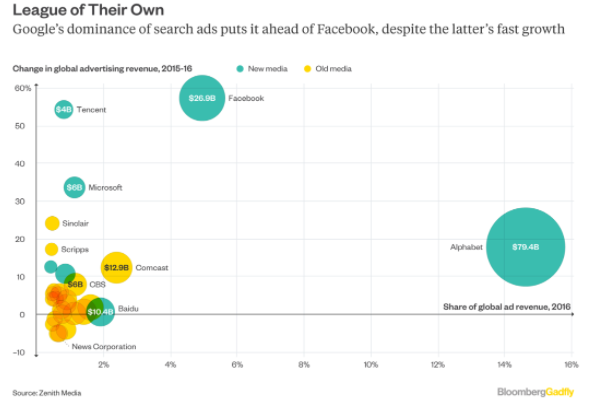 If Tencent successfully follows Facebook (it has the data), its mobile advertising have enormous upside potential. 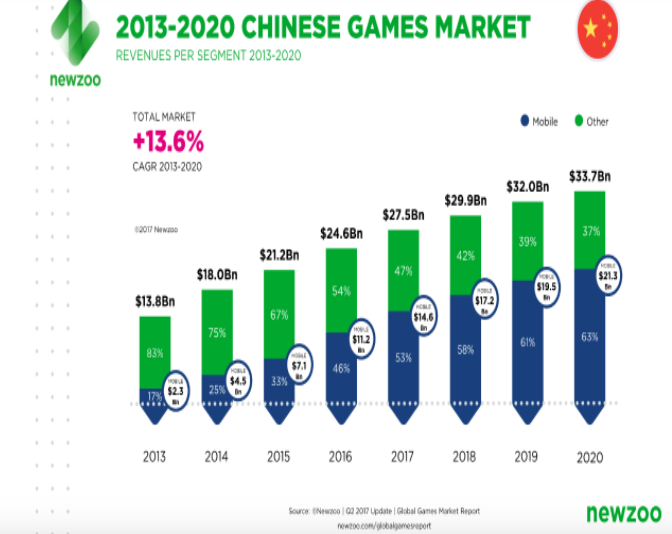 Chinese mobile gaming market is expected to reach $21,3 billion in 2019, up from $11,2 billion in 2016, with Tencent taking the lion share of the market. In first half of 2016, Tencent had a 44,7% market share in mobile gaming market inside China and its growth continues strong. In Q4 Tencent’s mobile gaming revenue increased 51% YOY. Tencent is one of the most active and prolific venture capital investors in the world. It is currently invested into 21 of 210 unicorns in the world (I probably missed some), and is not slowing down. Only since May 2017 they already invested into 19 different companies, the best know being Go-Jek, the Indonesian market leader in ride sharing. Tencent’s size gives it the ability to borrow funds cheaply, which they can invest with amazing results. They invested into Snap in 2013, now valued at around $15 billion, Didi in 2015, now valued at $50 billion, Lyft in 2015, now valued at $7,5 billion, and countless of others. Not only they invest abroad, when they invest at home, they can offer the invested company the expertise and the reach of Wechat, such as the case of Mobike and Didi, both of which are now integrated into Wechat Wallet, through which 938 million users can hail Didi and rent a Mobike. 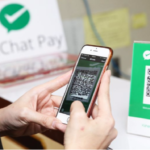 Companies that they invest in also integrate Wechat Pay into their apps, further increasing Tencent mobile payments revenues and improving the ecosystem. If you want to read more of my posts by Vito Petan follow him on LinkedIn! My name is Vito Petan, and I am a 24-year- old, Slovenian living in Shanghai, China. 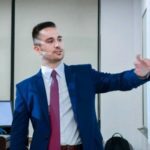 I am currently interning as a Research Analyst at Guotai Junan Securities (国泰君安证券), one of the top Chinese Investment Banks, completing buy-side research on emerging technologies and new trends such as: - Fintech & Blockchain - AI and Robotics - Electric Vehicles - Edtech - Clean & Renewable EnergyI am contributing articles for LinkedIn, where I mainly write about fintech in China and cryptocurrencies. My articles have been featured in Banking & Finance, Economy and Technology sections. I am also a contributing writer for one of the largest Slovenian daily newspapers, Dnevnik.